Society has made promising shifts in self-acceptance in recent years. Just a few years ago, it would've been taboo to post a photo showing off tummy rolls, stretch marks, or cellulite, but now, many people are turning to social media to get real about their various self-image struggles. These posts are often emblazoned with powerful hashtags, such as #bodypositivity or #allbodiesarebeautifulbodies, and showered with supportive comments from followers. 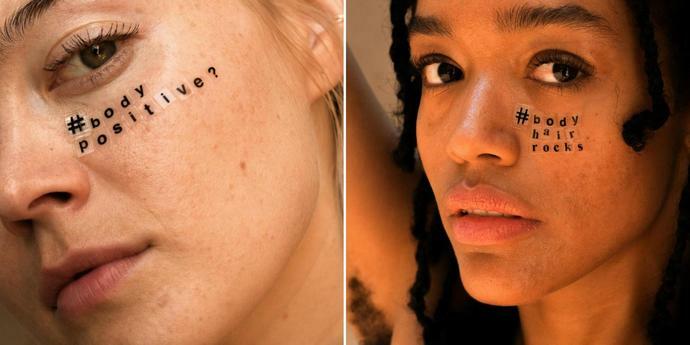 It's this forward motion that's inspired acne-positive photographer Peter "PJ" DeVito in his work, including his most recent project, a photo series titled "More Than Just a Trend." DeVito noticed that body positivity and diversity have also been trending topics in the wellness, fashion, and beauty spaces. This increased visibility interested DeVito, as well as model KrystyAna, and compelled them to team up on the photo series. They believe that the increased visibility of these issues can be viewed as a step forward, as we're now seeing a broader range of backgrounds, skin colors, and body types represented in media, but it also made them wonder whether some brands may be capitalizing on these progressive movements simply because of their headline-making capabilities. "More Than A Trend" is an initiative that seeks to negate the notion that matters like gender inclusivity, racial diversity, body image, and more are just fleeting, like yellow eye shadow or flower vase hair, and to remind people that their identities are not fads. "I met KhrystyAna through Instagram," DeVito tells Allure, "and she told me how she didn't like that people would act as if things like body positivity and being curvy are trends, [and then] we realized how this issue is bigger than just body positivity because it affects people from all different marginalized groups." He continues, "We came up with a concept for the project and decided that the best way to get our message across would be to have each person involved choose a hashtag and have them write a paragraph explaining why it shouldn't be considered a trend." KhrystyAna, who you may recognize from season 24 of America's Next Top Model, explains that she'd been an admirer or DeVito's work for quite a while before messaging him. Because the two already had so much in common, it was super easy to start a conversation about the work they wanted to create, and run with it. "It turned into a long discussion about activism, trends, fashion, the responsibility we have as artists to support the voices that aren't usually heard in mainstream circles, and how to bring visibility to people from all walks of life," KhrystyAna recalls. "We both found ourselves appreciating how, currently, many entertainment businesses are supporting more people than before, especially those from marginalized communities, but we both expressed concern about how this could just be a trend for them." "What if diversity is just a mainstream focus for now because it can be capitalized on?" she continues. "What if it all goes back to how it was, and these new voices become silenced again and met with rejection?" DeVito and KhrystyAna spoke for months before gathering friends and activists who were on the same page and wanted to spread the message, too. "Jillian and Samirah, who are two of the models, are my close friends, and they jumped onto our project immediately," says KhrystyAna. "Each of us was full of stories, but we picked just one hashtag each to bring out what matters to us today and will continue to matter tomorrow." For 32-year-old KrystyAna, it was important to address her conflicts with body positivity, specifically the ill-conceived idea that it's a movement targeted toward only curvy body types. It's for this reason that she chose to use #bodypositive? as her hashtag. "I would love to see all women equally focused on, from size 00 to 32," she muses. "Ultimately, I believe that we can celebrate life as it really is, instead of just focusing on a few set examples." DeVito, on the other hand, didn't choose a hashtag. He wanted to maintain his role as the man behind the camera and instead shared his own experience as it fit into the project's ethos. "I personally really resonated with KhrystyAna's image and the meaning behind it, because when my pictures started getting attention, it was because acne positivity was a 'trending' topic," he says, before adding, "But at that time, my skin was starting to clear up, so when I would post a picture of myself, people would always send me messages saying that I couldn't be promoting acne positivity with clear skin." As most of us know, this couldn't be further from the truth. You don't necessarily need acne or a certain skin color or dress size to support any of these significant movements or the individuals impacted by them. Collectively, what we do need to do is ensure that these movements don't dissipate, nor become less important over time. "I hope that this can help to show people that these movements shouldn't be categorized as trends," says DeVito. "When it comes down to it, a trend is a short-lived statement and these things are crucial parts of the people's lives who they affect. They shouldn't be going anywhere." All this to say: Allure is honored to give you an exclusive look at the "More Than A Trend" photo series, which DeVito, KhrystyAna, and the rest of the cast worked so beautifully hard to create.